"Hear Time/Date Announcements & Never Set It!" 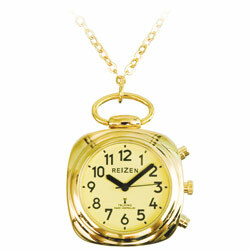 • Gold-tone watch, matching 30” chain and batteries incl. Hear the time announced - or view it displayed on the high-contrast yellow dial - with this Talking Watch. Plus, it's an atomic pendant watch, so it hangs conveniently around your neck and automatically updates time every day - so you never have to set it! In addition to the time, you can hear the date announced and also set the built-in alarm for important appointment and medication alarm reminders. And this talking radio-controlled pendant watch keeps accurate time, and even accounts for Daylight Saving's, thanks to a daily signal received from the NIST National Atomic Clock in Colorado - the nation's timekeeper. Measurements (approx. - including bezel): 1.50 in. Weight (watch and chain): 1.9 oz.